Stams is a village - as the name indicates - Tyrol, near Imst, to be precise. It is mostly the local Cistercian monastery, which was founded in 1273, that made the village the centre of scholarly life in the region. Today, Stams usually serves as a day-trip destination for visitors that come to explore the village for its stunningly picturesque outlay: The Baroque towers of the monastery in combination in an alpine setting ranks among Tyrol′s most scenic spots. The mountains in the surroundings are popular for both hiking and skiing purposes. The village itself has a less than 1300 residents and the first written record of Stams dates back to the 11th century. The parish church was originally a Gothic design built in 1315, but it was changed in Baroque styles later. Before the current church was built, the site was occupied by a small chapel that served as a regional or local centre of pilgrimage. Pilgrimages are currently undergoing a Renaissance in Austria and Stams is no exception: The "Jakobsweg" is a network of traditional routes leading to Santiago de Compostela. In Austria, many of the routes were recently "re-discovered" and modernised. Stams lies on one of them and has become a key-site in the Tyrolian part of the Jakobsweg. Getting to Stams from Innsbruck is fairly easy. It is situated some 35 kilometres West of Innsbruck in the Inn River Valley, which means that the highway runs just by it. Stams is not far from skiing paradise Seefeld. The Tyrolian capital is close enough for easy day-trips even by public means of transport. Sölden and the Ötztal valley are very popular for both hiking and skiing and the scenic town of Imst is more of a hub than Stams. 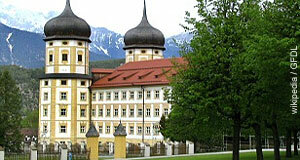 Similarly, the ancient town of Hall further to the East than Innsbruck is a very attractive destination for a day-trip.